Also, having them here made me realize how much I have done and accomplished this semester. Trying to fit Cape town into 10 days for my Mom and Dad was a challenge, and there was so much more that I would have liked them to experience. But, nonetheless, we did a lot in their time here and they were able to see many different aspects of Cape Town. Here’s a list of the things I made sure they were able to do! Hiking Lion’s Head – Seeing as Lion’s head has my favorite view of the city, I had to share it with my parents. Although it wasn’t what we were originally planning on doing that day, we quickly switched our plans and spontaneously hiked up the mountain to enjoy the scenery. Kirstenbosch Botanical Garden – This botanical garden is incredibly beautiful with such a wide variety of plants and flowers situated right underneath Devil’s Peak. My Dad’s favorite hobby is taking photographs of flowers, so he had the time of his life here, especially photographing the different species of South Africa’s national flower, the protea. Cape Peninsula Tour – This tour, as mentioned in one of my earlier blog posts, takes you from the Cape Town City Center all the way to the most southwestern tip of Africa. We stopped at places like Chapman’s drive, Hout Bay, the Cape of Good Hope, and Boulder Beach (where the penguins live). It is a great way to see parts of Cape Town outside of the city center bubble. Bo-Kaap Cooking Class – Another thing you’ve read about in a previous blog, my parents were able to partake in the Bo-Kapp Cooking Class. They really enjoyed learning how to make the Cape Malay foods and meeting a family so close to the neighborhood’s history and challenges. Taking the Cable Car up Table Mountain – Hiking up Table Mountain is quite the trek, so taking the 5 minute Cable Car ride up to the top is a great alternative that my parents and I took advantage of in order to see the unique top of Table Mountain. We found an early bird special and were even able to be the first cable car up with the staff that works at the shops atop the mountain. Being the first car up was super nice because there were no crowds and we were able to explore the mountain top at our own pace without having to navigate through people. We even saw some dassies running around. These are small animals that are actually related to the elephant, which live on top of the mountains in Cape Town. Surfing at Muizenberg Beach – the most popular surfing spot in Cape Town, due to it being on the western coast and having the best waves, is Muizenberg beach. My dad wanted to try surfing, so we went one day and got a lesson. I had tried surfing earlier in the semester without a lesson and it did not go well. The lesson, as you would think, definitely helped me get the hang of getting up on the board, and my dad did well, too! We stood up on our boards quite a few times and were able to ride a few of the waves to shore. Dinner at Mzansi – At the beginning of the semester my program took us to dinner at Mzansi, a restaurant in the Langa Township. They serve traditional South African and Xhosa foods. I wanted my parents to experience traditional South African food, especially the malva pudding, so I had to bring them to Mzansi for dinner. 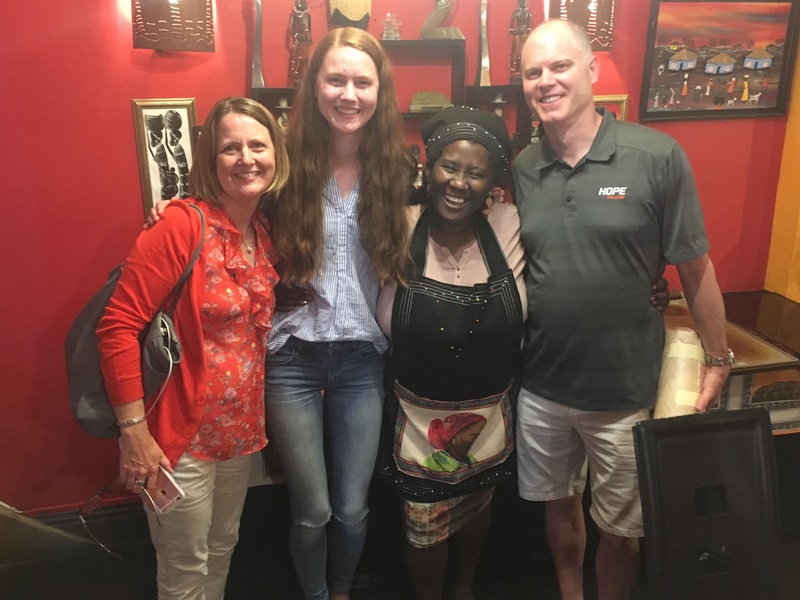 We enjoyed the food, the live African band, and the story of how the restaurant opened and became successful in the township, told by the woman who did it all. This restaurant makes you feel at home and provides a warm and fun experience overall. These were just a few of the things I was able to share with my parents, and spending time with them in this city that I’ve grown to love was so special!